The crystals in this set have been carefully selected to complement each other and for their properties to enhance a happy marriage on the couple's wedding day. 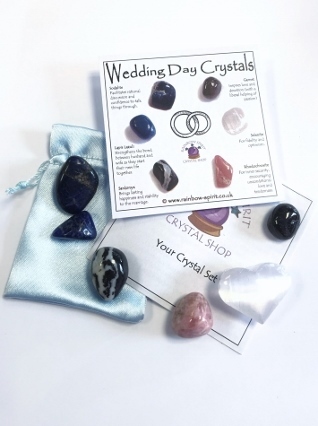 The set includes five 10-25mm stones (Sodalite, Lapis Lazuli, Sardonxy, Garnet, Rhodochrosite and a Selenite heart), a pouch, and comes with an 8x8cm card print of the poster with information to explain each stone. There's also my little guide to working with the set. This is one of our 'stock' items, so the photograph is an example of the set we will put together for you.